BEIJING — Chinese President Xi Jinping probably won’t give President Donald Trump a round of golf during their first face-to-face meeting this week, but he may find it worthwhile to ensure his American counterpart does not feel like he’s leaving empty-handed. Some view the informal venue of the summit Thursday and Friday — Trump’s Mar-a-Lago estate in Florida — as a sign that neither side anticipates important outcomes. Trump, however tweeted last week that he expects “a very difficult” meeting. Trump elaborated a bit Tuesday at a White House business forum, calling North Korea a “humanity problem.” But he sought to strike a cordial tone ahead of the meeting, saying he has “a lot of respect” for Xi. Like many nations, China is still grappling with Trump’s mercurial nature after the relative transparency and predictability of the bilateral relationship under Trump’s predecessor Barack Obama. Both during his campaign and after his victory, Trump complained repeatedly over China’s allegedly unfair trade practices, its perceived lack of assistance in reining in North Korea’s nuclear ambitions and its drive to cement control over the South China Sea. Some analysts believe Xi might be willing to hand Trump a symbolic victory on trade to put a positive spin on the meeting. “Xi probably can’t accommodate Trump on sovereignty and security issues, but he has a lot of leeway on economics,” said Robert Sutter, a China expert at George Washington University in Washington, D.C. 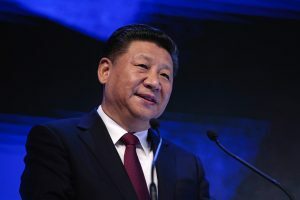 Yet even if Xi is able to offer Trump deliverables, he will still have to deal with “a restless U.S. president valuing unpredictability and seeking advantage for his agenda going forward,” Sutter said. Trump was seen as moving trade even more to the forefront when he signed a pair of executive orders Friday focused on reducing the trade deficit. Coupled together, the orders appeared to be a symbolic shot at China, which accounted for the vast bulk — $347 billion — of last year’s $502 billion trade deficit. While aides insisted the timing was coincidental, the administration touted the moves as evidence of it taking an aggressive but analytical approach to closing a trade gap that is largely due to the influx of goods from China. Having suffered a major blow with the failure of health care reform, Trump will be seeking to claim some kind of victory in his encounter with Xi, said June Teufel Dreyer, professor of political science at the University of Miami. Trump’s comments on trade and other issues “portend some hard bargaining,” Dreyer said. She added, however, that slowing economic growth in China could limit Xi’s options for negotiating on trade. “So the stage is set for a battle royal,” Dreyer said. Meanwhile, China continues to oppose the tough measures demanded of it to address former close ally North Korea, fearing a collapse of the Pyongyang regime would bring a crush of refugees and possibly U.S. and South Korean troops on its border. Trump told the Financial Times the U.S. is prepared to act alone if China does not take a tougher stand against North Korea’s nuclear program. Add to the mix the issue of the South China Sea, where China has built and armed man-made islands despite the concerns of neighboring countries; and Taiwan, the self-governing island democracy that China claims as its own territory, and that some in Trump’s administration would like to build a stronger relationship with. So far, few details of the summit’s agenda have been released. China has said only that Trump and his wife, Melania, would host Xi and his wife, famed songstress Peng Liyuan, at a welcoming banquet. As personalities, Xi and Trump are a study in contrasts. A lifelong Communist Party apparatchik and son of a former vice premier, Xi has built his career with a cautious approach, avoiding controversial reforms and rarely speaking out in ways that would distract from his core message. His nearly five years as head of the ruling party have been defined by a campaign to achieve the “Chinese dream” of increasing prosperity while tackling endemic corruption. While Trump is an avid golfer, Xi has never been known to hit the links. In fact, his administration has actually pursued a crackdown on golf-course development, pushing instead for mass participation in soccer. Still, outwardly cordial relations with U.S. presidents are also a longstanding Chinese tradition, in recognition of the importance of the relationship. Xi had taken pains to appear at ease in the company of Obama, avoiding the rancor that characterized the relationship between the American leader and Russian President Vladimir Putin. That approach has been borne out in pronouncements by Chinese officials and state media that have been moderate in tone. Responding to Trump’s tweet about the trade deficit, the foreign ministry’s Zheng portrayed the issue as one in which the two countries had an equal stake. “China will continue to work with the United States to think creatively and keeping pushing for greater balance in China-U.S. trade,” Zheng said. At its nub, the summit is more about establishing a working relationship than making progress on any particular issue, said Su Hao, a professor of diplomacy at China Foreign Affairs University. “The most important thing is that the top leaders are able to have direct communications on the most important major issues and candidly exchange views,” Su said. Associated Press writer Vivian Salama contributed to this report from Washington.